Computerized regulation thermography can be performed on anyone; child, adolescent or adult. The theory behind the value of the CRT is that the test quantifies the body’s response to stress and the test can characterize the type of response stress induces. The effects of stress can transform the body from a resilient mending machine to a poorly defended fatigue ridden mass of muscle, bone, and spirit. Since the early 1970’s, German investigators began analyzing temperature changes on the skin as a response to cold-induced stress. It turns out that the body’s response to cold-induced stress is self-similar to the body’s response to predatory stress. The reaction is just of a lower intensity. The response is fractal, not linear. These are terms that can be considered polar opposites and the messages associated with the terms are also on the opposite ends of the spectrum of analysis. Fractal is much more in accord with nature. Thermography is a method to examine and quantify the effects of stress on the body. It allows a physician to find the areas of the body that are most affected or vulnerable to disease. When the blood measurements are matrixed to the thermography, the patient’s care plan will be tailored to them, not to some standard plan based on symptoms and assumptions. The CRT procedure is simple: Subjects disrobe in a private laboratory and have 125 points on the head, neck, torso, back, and breast measured twice at a 10 minute interval. The results are printed out in a graphic pattern know as a contact thermogram. The thermogram can detect the parts of the body that experience the detrimental effects of stress and thereby guide the interpretation of the serum and blood data. Please read the instructions carefully. If you come unprepared for your test, we will have to reschedule. If you have any questions or concerns, feel free to call us at 901.867.1018. Electrocardiography is a report of the electrical activity of the heart that is measured over a span of time. The activity is detected by electrodes that are attached to the skin, usually across the chest, and are connected to the recording device that is external from the body. The procedure is noninvasive and is often used to measure the rate and regularity of heartbeats. The EKG reports can also be used to determine several other factors related to the heart including the position of the chambers, the presence of any damage to the heart, effects of drug use or the effects of any regulating devices such as pacemakers. The Stone Institute offers the EKG as prescribed by Dr. Merigian and can be performed on the same day as your office visit if needed, or an additional appointment can be scheduled. What Lab Work is offered? We can perform a full panel of tests that analyze blood or other body specimens. This analysis provides critical data for diagnosis, treatment planning, and preventative health care. What are hormone replacement therapies? During your first or second visit, Dr. Merigian will analyze your blood as part of the diagnosis process. He will explain the results and how they affect your specific therapeutic adventure. 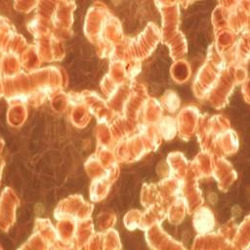 Oftentimes, your blood will be analyzed under the dark field microscope throughout your treatment in order to evaluate and track your progress. Patient with shortness of breath, fatigue, and ringing in ears. Had been ill for months. 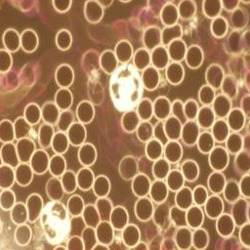 Picture shows severe rouleaux (coin stacking) and oxidative stress (fibrin deposits). After antibiotic therapy for a presumptive chronic infection, the blood normalized. Although fragile at this point, the patient is fine after a complicated and prolonged therapeutic journey.